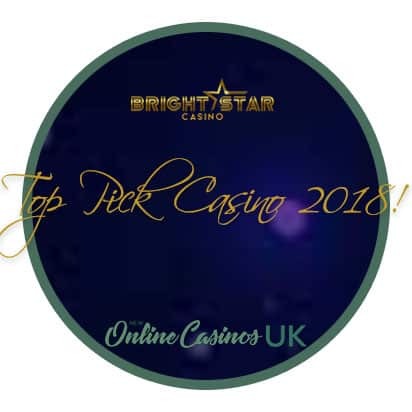 Bright Star Casino | Read UK Review 2018 & Claim Your Bonus Here! Just as the name implies, Bright Star Casino is positioned to give you an experience that is out of this world. The website has a stunning design that is as bright as a shining star. Bright Star Casino was created in 2018. The developers have incorporated some of the shortcomings of most other platforms into its design. They have a vast collection of unusual quality games so you can be assured that you will find your favourite games. Bright Star Casino has employed the services of the very best game developers in the industry. Also, their support service so far is excellent. Bright Star Casino is as of today authorized by the Maltese Gambling Authority as well as the UK Gambling Commission. This is to ensure fair play while also creating more room for a huge player base. The site is well adjusted to suit mobile devices of various operating systems so you can always enjoy your favourite game at your comfort. Bright Star Casino has a lot of promise. This review is directed at investigating their accomplishment so far. Bright Star Casino has some of the best games in their collections. With over 15 of the absolute best game manufacturers at their disposal, Bright Star Casino has over 350 games in stock. If you are a fan of the slot, then you have nothing to worry about. Typical slot games include Blood Queen, Samurai Split, Foxin Wins, Ho Ho Tower, Lightning Gems, Birdz, Halloween, The Phantom of the Opera, Planet of the Apes, seven up, Ted, Dracula, Spectra, Wild West, jack Hammers etc. Bright Star Casino has few games in their Roulette collection. Examples include; European Roulette, French Roulette, Club Roulette, Lights, American Roulette, Roulette Master and a few others. The selection of games in the Blackjack category is also few, but there is no doubt you will find your favourite games as well. Blackjack Pro, VIP Blackjack, Blackjack Standard, Vegas Strip, Classic Blackjack among others are found in this category. Other categories of games located in Bright Star Casino include Table Games, Live Games, Scratch Cards and Mobile Games. The mobile games section have been specially designed to be compatible with any smart mobile device. To have this quality of games, Bright Star Casino works with NetEnt, NextGen, Microgaming, Playtech and a host of others. Bright Star Casino offers a 24/7 customer support via email and live chat. They have a crew of experienced support staffs that have been educated on the rudiments and expectations of online gaming. The response so far is in a few minutes. Additionally, they have an FAQ section. Here, there is a collection of potential and most common problems thereby decreasing the traffic on the queue. Furthermore, Bright Star Casino also has a social media presence which is an added advantage for them. Their presence on Facebook, Twitter and Youtube create an open platform for people to even share their ideas and suggestions. Also, Bright Star Operator grants some time-restricted campaigns. This will make it easier for members to be notified and feel these improvements. With a website that is secured using a 256 bit SSL encryption, there is no doubt that Bright Star Casino understands the need for security. Player information and banking details are handled with care. Concerning transfers to the operator and transfers from the operator, Bright Star presents players with remarkable payment options. However, some of the payment options available for deposit are not available for removal. Every transaction assistance at Bright Star Casino is managed by Olorra Management Limited. Olorra management Limited is a prime firm that gives secure and quick payment services to her clients. The operator takes the latter payment methods; MasterCard, Neteller, Direct Bank Transfer, Skrill, VISA, QIWI, Trustly, Paysafecard, Maestro, amongst others. The transfer is immediate, withdrawal is subject to Bright Star Casino’s withdrawal plan. There is a set highest transfer limit. There are a couple limitations in cases of growing jackpot winnings. In this case, Bright Star Casino sets its monthly ceiling at $30,000. Concerning other platforms, this is truly on the low. Furthermore, it is stated in the withdrawal policy that all withdrawal request will be pending for three business days before it changes to processing. Often, deposits take between 3-6 business days which is pretty dull. Anyhow, just members from Sweden experience a swifter withdrawal time normally between 1-3 business days. Bright Star Casino has all the advantages of a new platform regarding the speedy response. They currently offer 24/7 support services via email and live chat. The quality of their games is seen in the class of their game developers. They have a comprehensive variety of top quality games in their collections. Of course, they are not without setbacks. Their delay in payment can be quite frustrating. However, since it is stated on the website, you already know what to expect. In all, they might be the new kid on the block but at this pace, not for long.